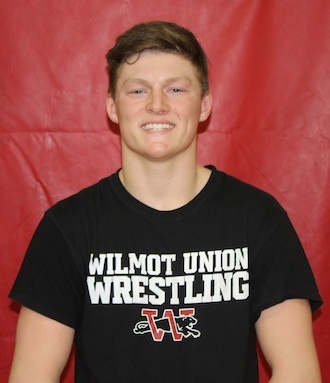 Behind six pins, and two Falcons forfeits, the Wilmot Union High School wrestling team edged county rival Westosha Central 56-19 in a Southern Lakes Conference dual meet on Jan. 24. Wilmot won the dual meet on Senior Night, where the Panther program honored 9 athletes, including winners Larz Gough (195), Max Iverson (220),Kolby Moudy (106), Drew Hebior (160) and Gene Johnson (132). The other four seniors were Jacob DuChemin (182), Taylor Eidson (170), Michael Dennis (138) and Ian Cruz. “We tried to get every senior out there because it was senior night,” said Panthers coach John Watson. While Watson was generally satisfied with the meet, he acknowledged there are areas the team needs to improve in. For the Falcons, coach Jason Ladd came away pleased, considering his team battled in all contested matches. The Falcons, meanwhile, jumped to an 11-0 lead after winning their first two bouts, with senior Sean Gulliksen defeating Eidson on a 15-0 technical fall. Sophomore Bryce Sekey then followed up by sending Jacob DuChemin to the mat in 2 minutes, 32 seconds, which drew the largest applause from the Falcons fan section of the match. “Bryce is definitely someone that goes out there and tries to be a spark plug,” Ladd said. The Panthers, however, responded with back-to-back pin victories, starting with Gough at 195. He defeated Niko Therman at 0:46. Iverson, at 220, then pinned junior Corbin Spencer in 0:46 at 220. After junior Andrew Tucknott won on a forfeit at 285, the Panthers added their third and fourth pin victories. At 106, Moudy pinned freshman Evan Beth at 2:48 and sophomore Cameron Baird won his bout at 113 by sending freshman Collin Fort to the mat at 3:53. “That 106 match was a nice match for Kolby, he has been injured for a long time, and it was nice to get him on out on the mat,” Watson said. The Falcons, who took a forfeit at 120, snapped the six bout drought with sophomore Lucas Wittkamp 15-4 major decision against sophomore Gabe Handorf. Johnson, of Wilmot, answered by pinning junior Aaron Pecore in 3:43 at 132. Westosha Central senior Jefferson Kearby defeated Dennis on a 10-2 major decision before the Panthers rattled off three straight wins to close out the meet. The Panthers received wins from sophomore Mason Diedrich (145), who defeated junior Colton Soto on a technical fall, along with junior Logan Pye (152) and Hebior. Pye, facing Falcons’ junior Jacob Seward, bounced back from an early deficit to win 9-7 in overtime. Pye, an honorable mention on Wisconsin Wrestling Online, showed perseverance on the mat against Seward. “What a great experience for him to learn how to deal with that situation,” Watson said. Hebior capped off the duel match by pinning Falcons’ senior Brenden Wittkamp at 160. Hebior, according to rankings released by Wisconsin Wrestling Online, is No. 6 among Division 1 athletes in the state. Watson said Hebior is the team’s best chance at having a representative at the WIAA Division 1 state meet in Madison. “He is probably our best chance, you never know what is going to happen, but he has the best opportunity,” he said. 170 – Sean Gulliksen, WC, def Taylor Eidson, TF 15-0 0:00; 182 – Bryce Sekey, WC, pin Jacob DuChemin, 2:32; 195 – Larz Gough, WIL, pin Niko Therman, 0:46; 220 – Max Iverson, WIL, pin Corbin Spencer, 0:46; 285 – Andrew Tucknott, WIL, won on forfeit; 106 – Kolby Moudy, WIL, pin Evan Beth, 2:48; 113 – Cameron Baird, WIL, pin Collin Fort, 3:53; 120 – Benson DuChemin, WIL, won on forfeit; 126 – Lucas Wittkamp, WC, def Gabe Handorf, MD 15-4; 132 – Gene Johnson, WIL, pin Aaron Pecore, 3:43; 138 – Jefferson Kearby, WC, def Michael Dennis, MD 10-2; 145 – Mason Diedrich, WIL, def Colton Soto, TF 15-0 0:00; 152 – Logan Pye, WIL, def Jacob Seward, SV-1 9-7; 160 – Drew Hebior, WIL, pin Brenden Wittkamp, 3:01.